You'll have noticed, I'm sure, the picture of the notebook on the home page. (Bottom right in case you missed it) It occurred to me that I hadn't ever got round to making the model that's shown on that page. 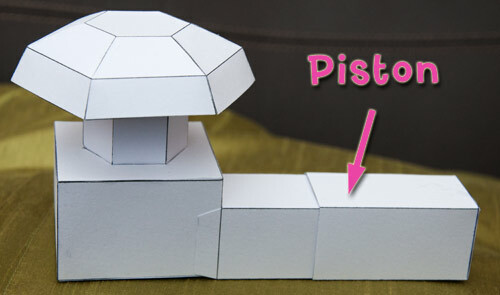 I like the idea of using pneumatics in a paper model. This model is a test of principles, to see what is practical. What works and what doesn't. I'm starting simple and will take it from there. 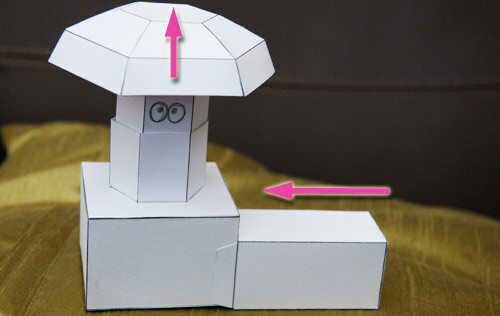 The mushroom character sits on top of a box with a body closely fitting inside a hexagonal tube. It needs to be a tight fit to keep the air in but not so tight that friction stops it moving. I'll be trying out a couple of different sizes of body inner to see where the right balance lies. The base box has a small hole in it, roughly 7mm square. Before adding the piston I tested the model by blowing through the hole. 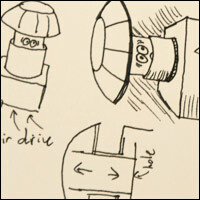 I then added the piston. It has roughly 50% more volume than the volume displaced by the moving head, to allow for leakage. It works well but I may try using double or more volume to see how that works. More soon, meanwhile I'm off to do some more layout and colour work on the belt drive robot, don't worry, I hadn't forgotten. So this would be a relative of the Puffball then ?